How S. Korea's Plastic Surgeons Are Helping Scarred N. Korean Defectors : Parallels Assimilating into South Korean society is rarely easy for North Korean defectors. Top plastic surgeons are volunteering their services to help minimize the scars they bear from painful, abusive pasts. 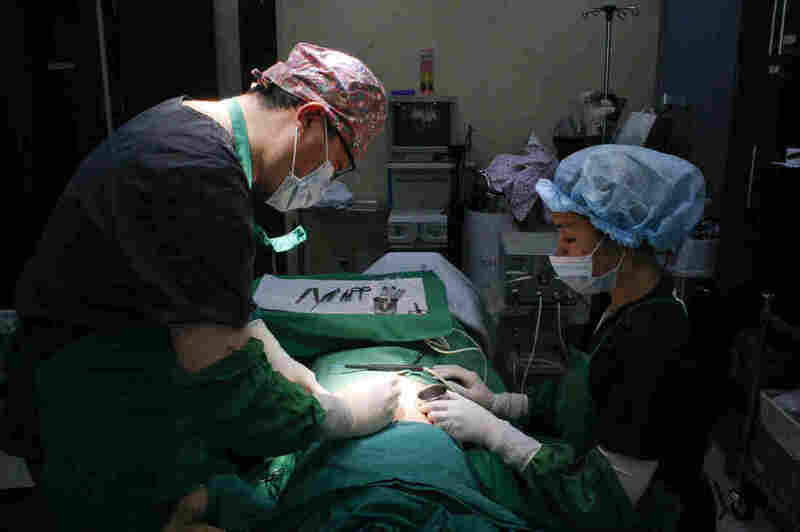 Dr. Hong Jung Geun, chief surgeon at Metro Plastic Surgery Clinic in Seoul (left), performs a pro-bono scar removal procedure on a former North Korean. South Korea is a place where appearance really matters. The country's cosmetic surgery prowess is known the world over. It's one of the world's top plastic surgery markets, and by some estimates, more cosmetic procedures are performed here per capita than anywhere else on the planet — mostly facial enhancements such as Botox injections, eyelid jobs or nose jobs. But lately, a few doctors have been putting their highly sought skills to use in a different way. They're helping North Korean defectors erase the scars from painful, abusive pasts. "There are many ways a doctor can contribute to society. One of them is donating talent," says Dr. Hong Jeong-geun, chief surgeon at Metro Plastic Surgery in Seoul's affluent Gangnam district. He's part of a 2-year-old pro bono program pairing Seoul's top surgeons with defectors who want to remove the scars that are holding them back from a full life in South Korea. Dozens of plastic surgeons from Gangnam are taking part. So far, the program has helped two dozen defectors. Some 40 more are on waiting lists. All 28,000 defectors who live in the South are eligible to apply. 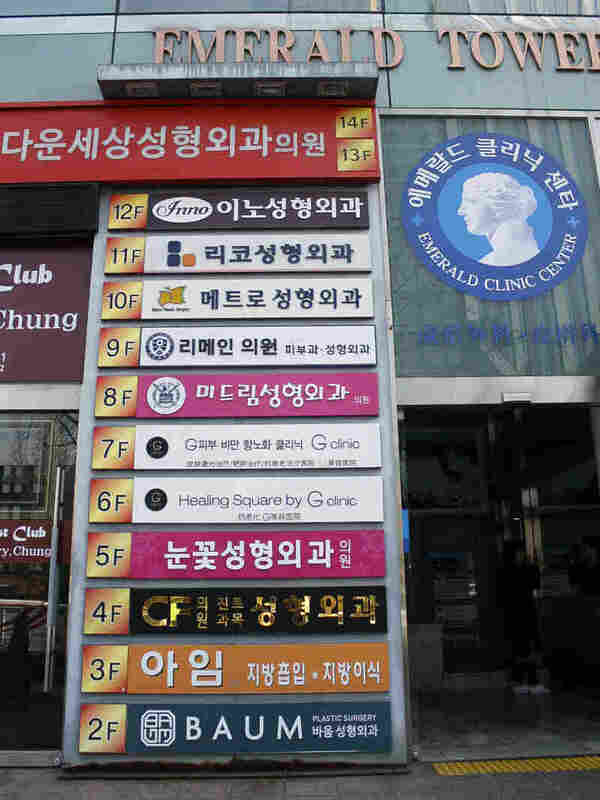 Gangnam is Seoul's Beverly Hills, at least when it comes to plastic surgery clinics. You can find 500 cosmetic surgery centers within a single square mile, often stacked on top of one another in multistory buildings. On one recent day, Hong prepares to remove a long scar that bisects a patient's stomach. The procedure is routine, but unique because the doctor is charging nothing for it. The patient, a woman named Choi Ri-ahn, sustained the scar after being injured in a car accident in North Korea 10 years ago. She's felt ashamed about going to Korean spas or swimming pools ever since. "I don't hope to return to the way I used to look," she says. But "I'm a woman and I suffered because of my wound. So I am excited about having more confidence." Kim Kyeong-suk, a police captain in Seoul, started the plastic surgery program in 2014 through her work with defectors. Police departments in South Korea are charged with helping provide services to former North Koreans after they resettle in the South. "You have to manage and care for North Korean defectors and make sure they're protected," Kim says. She found that many bore scars from abuse or accidents that happened while they were living in or escaping from the North. Those scars can make assimilation or finding work in South Korea especially tough. Job applications must come with photos. Subway stations are fitted with full-length mirrors for primping. High school students commonly get nose or eye jobs as graduation presents. A floor-level guide to a multistory building in Seoul's Gangnam district shows a different cosmetic surgery clinic on every floor. It's hard enough to fit in as a South Korean. For the North Koreans who resettle here, distracting scars can be automatically disqualifying. So Kim teamed up with Seoul's plastic surgeons who wanted to donate their talent and time. "We would help them get rid of tattoos, burn marks, scars or any sort of abnormal parts of their body," she says. Joo Eunjin, a woman who'd been sold by traffickers to an abusive Chinese farmer when she was just 16, was the the program's first patient. "At the height of the North Korean famine in the mid-1990s, everyone was starving," she says, alternating between Mandarin Chinese and Korean. "Some guys who later turned out to be human traffickers lured me onto a train." Now in her late-30s, Joo lived in China for more than a decade before making it to Seoul. "I tried to escape again and again," she says. "Every time I tried to escape, the Chinese man got really angry. He would beat me up and burned my chest with cigarettes. And the top of my head, here." She parts her hair at the center to show the place where cigarettes had burned her scalp. After escaping to the South in 2009, Joo met Capt. Kim, and her story inspired Kim to find a way to help. Doctors first gave Joo a hair transplant to cover the burn-scarred bald spot on her head, and then, through multiple surgeries, gradually removed the burn marks from her chest. Now she can go unnoticed in South Korean society, where sticking out stings. One of Kim's goals in launching the plastic surgery program was to ease North Koreans' transitions into their new lives. "I want to show that defectors have resettled into South Korea well," she says, "and they've been cared for warmly." As far as Joo is concerned, Kim has succeeded. "I'm thankful that after the surgery, I was able to walk around confidently," Joo says. "But more important than the surgery was the love I got from the police officers. In China, I was always scared of the police. Here it was the police who gave me love."